One woman has died and 13 have been injured in a crash between a double decker bus and a car in Cambridgeshire. Firefighters at the scene worked to free people trapped in the wreckage of the vehicles. The accident happened at 1110 BST on the A47 at Thorney near Peterborough. The road was closed in both directions while an investigation got under way. The East of England Ambulance Service confirmed that one woman died at the scene. The road has since reopened. Of the 13 injured, one woman was taken by air ambulance to Addenbrookes Hospital in Cambridge with a fractured pelvis. Another woman was taken to Peterborough District Hospital with suspected neck and back injuries. Another six people described as "walking wounded" were also taken to Peterborough District Hospital for treatment. An ambulance service spokesman said five casualties were treated at the scene. First First East England confirmed the bus was one of their vehicles operating on the X1 route between Lowestoft and Peterborough. Bus company spokesman, Gussy Alamein said: "There has been an incident involving a car and one of our X1 buses and we are working with the police in their investigations. "We would like to offer our deepest sympathies to the family of the car driver who tragically died in this incident." 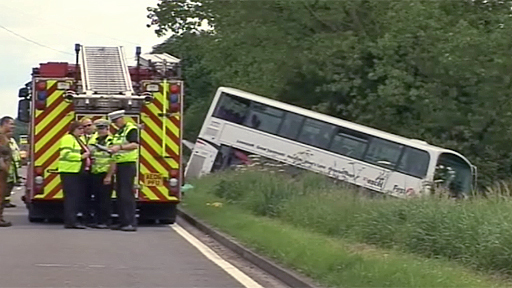 A man who was on the bus when it crashed into a ditch spoke to BBC Look East. He said: "I was using my laptop at the front of the bus and I heard a noise and shouted out to God to help me and he did. "My head hit the front of the bus and I got out. "I thought this could be the end, I saw the bank coming towards me, there was no time to think."